River and lake fishsuch as carp, pike, carp, perch often cooked in sour creamthan the sea. Sour cream helps to fight off the characteristic smell of slime, making the fish soft and delicate. In addition, fish, kiln entirely under a Golden crust of cream – beautiful and delicious dish. Clean the fish from scales. If it is not eviscerated – remove the entrails. Do this carefully so as not to damage the gall bladder, otherwise the fish may acquire an unpleasant bitter taste. 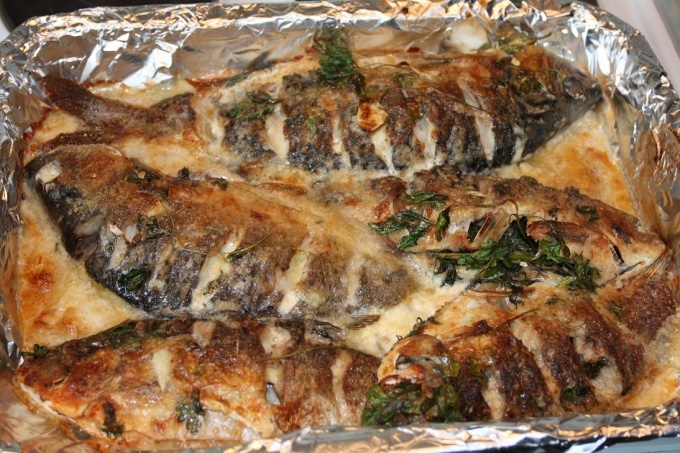 Fish baked in sour cream, prepared entirely with the head therefore it is necessary to remove the gills: they delayed particles of sand, silt and mud. After this, rinse the fish under cold running water and Pat dry it with a napkin. Salt the fish and sprinkle it with ground black pepper inside and out. Add a bit of coriander. Coat all sides with vegetable oil – sunflower or olive. Put in the abdomen sprigs of parsley and dill. Another method of preparation can be applied to fish that have a lot of bones. The fish should be cut in half along the spine and remove the spine. Then remove the ventral bone, and made two lateral incisions from the inside out. Appeared in sections of bone should be removed. Then the fillet is formed to shape and then baked as whole fish. Grease a baking sheet with vegetable oil, lay on the middle of the fish. Fill the glass about 50 grams of water and pour into pan. It is necessary to do to the fish in the oven do not overheat. Place baking sheet in a preheated 150 degree oven. Keep the fish there for 20-25 minutes. Then remove it and give it a coat with sour cream, without removing from the pan. Sour cream for this dish is better to take fatter so less dripping during baking. Once fish is coated, return it to the oven. Keep it for 10-15 minutes. The result should be a delicious Golden crust. If not, turn on for five minutes grill the fish is browned. Classic side dishes to fish dishes are potatoes and rice. Fish in sour cream goes well with mashed potatoes, and plain boiled or fried potatoes. The rice should cook for a short time, so as not collapsed, and preserved form. The dish can be decorated with greens, salad, vegetables. Not overheat the oven. Purified from the scales of the fish may stick to the baking sheet firmly, and scrape up traces of it will be very difficult.